Foxtrot is a smooth and graceful traveling dance typically done to big-band swing music. It traces its history back to the early 1900's, and its name to vaudeville actor, Harry Fox, who featured the dance in one of his 1914 shows. Soon after, dancers everywhere were dancing the Foxtrot to ragtime music, then to 1920's jazz, then to swing music. It became the most popular dance of its time, was widely danced throughout the swing era alongside Shag, Lindy Hop, Balboa, and other dances, and persists in prominence today as part of every ballroom dance curriculum. Foxtrot is related to both East-Coast Swing and Charleston. The original jazz-era Foxtrot differs in several ways from today's dance. The original dance, in fact, was a quite easy One Step that consisted of walking. "If you think Foxtrot is difficult, you're probably doing it wrong....The dancers had the option of introducing more elaborate step patterns, but all rested on a foundation of walking. Its simplicity and infinite variability meant that it could be adapted to almost any dance situation." [Mass Historia: The Jazz Age Foxtrot] For decades, dancers would dance Foxtrot to any speed of music, prompting record labels to label most 4/4 time recordings as "Foxtrot". Over the years, Foxtrot has evolved and split into multiple dances. Variations of Foxtrot have included the One Step, Slow Foxtrot, Fast Foxtrot, Quickstep, Peabody, and more. 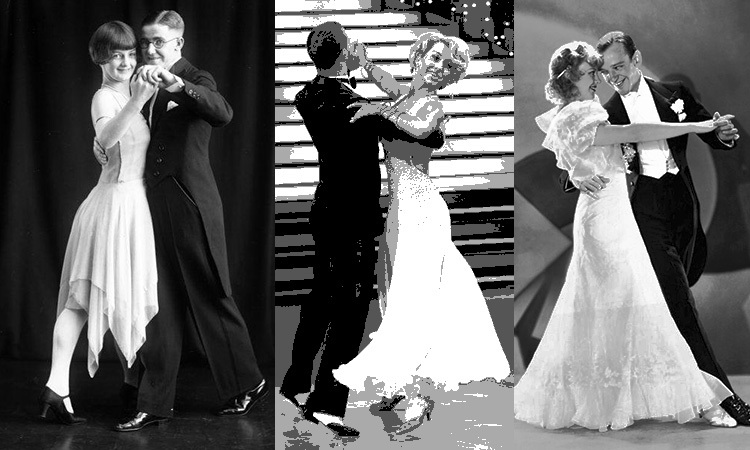 Today's ballroom dance world has set tempo guidelines for what they consider Foxtrot and has universally adopted two of the many possible footwork combinations (Slow-Slow-Quick-Quick) and (Slow-Quick-Quick) as the basis for the dance. Regardless of how you dance it, Foxtrot remains a fun way to dance yourself and your partner around the floor! Swing Time's Foxtrot classes are designed for everyone, from novices who've never danced before, to experienced dancers who've been dancing several years. There are no prerequisites, so anyone can drop in and take them. All classes stand on their own; you need not take one to take any of the others; but the more you take, the better your dancing will be! No partner is needed.